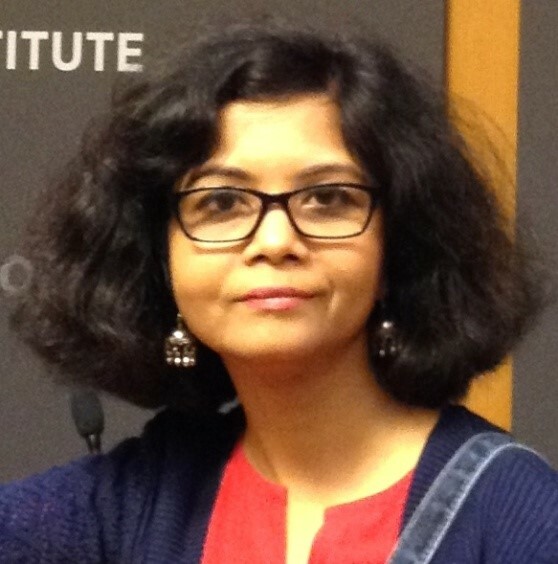 Papia Sengupta completed her doctoral studies at Jawaharlal Nehru University in 2013, where she works as an Assistant Professor. Her research interests include women’s rights, language in federal polity, minority accommodation and power sharing, multicultural policies and governance in democratic politics. Her work was recognised as a Distinguished Teacher of the University in 2009 by the former President of India A.P.J. Abdul Kalam. She has held fellowships from Cornell University, Brown University and was awarded a Visiting Research Fellowship from IASH and the School of Social and Political Science at the University of Edinburgh in 2015-16. Sitting in a small claustrophobic room, there I was in front of the magistrate who was trying to reconcile me and my husband, against whom I had filed a divorce case based on violence. The magistrate was a middle-aged man and looked aghast when I calmly told him that I didn’t want reconciliation as I didn’t want to live with my husband. Trying to make me understand, the magistrate started narrating a story from the Hindu epic Mahabharata, the great battle fought between cousins Pandavas and Kauravas, where Pandavas killed all Kauravas in order to protect righteousness (dharma). After narrating, the magistrate looked at me and stated that, ‘you know, Draupadi, the wife of the Pandavas, was responsible for the war and decline of the mighty Kuru empire. Women with pride and self-respect always bring trouble with them’. He went on and on, trying to reform me about values of household, family and holy wedlock. Reasoning with me about how men—due to their impatience—are at times violent, but violence was a form of their love. Women, he said, must be forgiving and not like Draupadi. While he was immersed on his story telling, the last sixteen years of my life were flashing in front of my eyes. I have known my husband for all those years, six years of courtship and ten years of marriage. I knew him since I was sixteen years old. That day, there I was, a women of thirty two. I was sitting blankly in silence, but there was a conflicting conversation going on inside me. I have loved this man, laughed with him, comforted him and today here I am seeking divorce from him. I found myself answering my question—because I loved him blindly, forgiving all his faults, stood by him in thick and thin. Until then, I had completely forgotten that cruelty is bad but suffering cruelty is worse. And my daughter of two years taught me that. My small, cuddly, bundle of joy who—with her screaming as if she had phobia of her father—showed me how wrong I have been. I got up without realising why. The magistrate looked puzzled and looked at me as if saying: ‘I am not done yet’. I smiled at him and said: ‘Thank you, I am done’. By then, I knew the magistrate would never understand me. Why should he? He was himself a victim of patriarchy just like me. But he didn’t stop. Just went on cursing ‘education’ and ‘modernity’ and my ‘economic independence’ for having spoilt me, and for making me bold enough to shake the very foundation of family. I didn’t look back, just kept walking. Education has given me what I am today. I am so glad my parents educated me to the best of their ability and gave us values of perseverance, confidence, care, love and respect. I had forgotten that we must respect others but first and foremost respect ourselves, which I did not remember till that day. 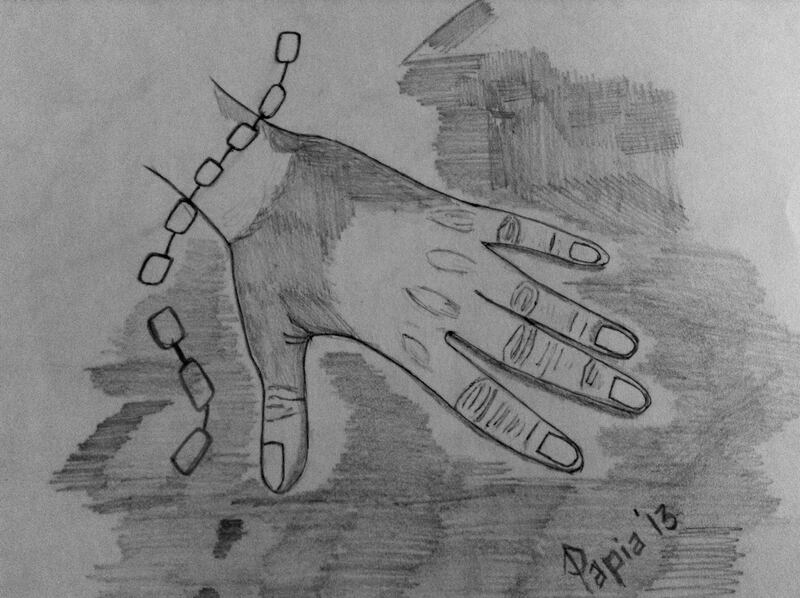 ‘Breaking Chains’: a sketch of Papia’s inspired by her experience. There was no regret in me. I had been working nonstop to provide comfort and happiness to my husband for the past five years, whereas he didn’t have a job. I had reasoned out that as a believer in equality between men and women, even if my husband was jobless, it didn’t matter to me whether he was working or not. If both the wife and husband are in love, that’s what matters, nothing else. What’s the big deal if I work all days without any off, even on Sundays? It is fine. I do it for my family. My ordeal with the judiciary did not end there. I kept on going to the court for five more years, hoping that one day I will get a divorce. My case kept getting deferred, with judges being transferred and changes in jurisdictions. At home, with my husband gone, my daughter had grown up from four years to nine, from a timid, scared child always hiding behind the bed, frightened by the man who happened to be her father, to a fearless, carefree, lovable, music lover. She calls me ‘mapa’ at times, meaning ‘ma-papa’. I am growing up with my daughter. In 2010, my husband had signed the first motion of divorce but never came to sign the final divorce papers which is mandatory according to the Hindu Marriage Act of India, under which I was married. The law allows divorce on mutual consent when both the partners sign the final papers within 18 months. The judge told me very matter-of-factly that I had to file a fresh case of divorce. He said: ‘your husband has not appeared in the court to sign divorce papers and so you cannot get a divorce. Think about it—life has given you another chance. Look, you have a girl child, who will marry her? Go back to your husband’. This time I did not smile, just pitied the magistrate and told him: ‘yes, I am a proud mother of a daughter and even if I had ten daughters, I would still not go back to my husband’. He retorted: ‘you educated women, look at your pride…you never asked for alimony or maintenance for your child. You think you can do everything on your own? You have got so much courage to shake the very foundation of family. You teach your students to question the status quo, to stand for their rights. You are proud to have given birth to a girl child. You are a danger to our society’. This time when I walked out of the court I was not only smiling but was as happy as a child. And I was repeating aloud: I am dangerous. Yes I am a dangerous woman and proud to be one. To this day, I have not been divorced, not officially. The courts in my country are too patriarchal and I did not have money to waste on court cases and lawyers year after year. I realised it was best to spend my limited resources from my salary on my daughter and her education rather than wasting it on the court case. I asked myself: what would the court give me? But I am free. Nobody can put me in chains except me. I decide for myself. Yes, I am a dangerous woman. I live on my own terms, fight patriarchy and injustice, stand with my students and numerous women whom I don’t even know. Yes, I am dangerous, because I live with my head held high. I wonder, who these magistrate and judge are? Are they fiction or real, in 21st century? These guardians of justice themselves need to be sued for saying illegal things? Or, may be your husband is a ruling part patriarch with wide connections to the power hierarchy! Ah! what a democracy!!! !